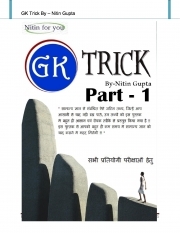 Description of "GK Trick Part - 1 (eBook)"
Reviews of "GK Trick Part - 1 (eBook)"
	World’s only colored book of Memory and Mental Math. 	World’s only Brain book having more than 200 colored illustrations. 	World’s only book which trains logic and verbal memory. 	World’s only book of Guru Ganit, simpler from Vedic math. 	N L Shraman is the only Hindi and English Mnemonist in the World. http://en.wikipedia.org/wiki/Mnemonist. 	World’s only book which trains basics of 51 subjects to a child of 4 years. 	World’s School teaches what to read, this book teaches how to read. 	World’s only book an alternative to tuitions and teacher of teachers. 	World’s only book for all ages: Students, Teachers, Working, Old Young. 	World’s only book which improves grades in school immediately. 	World’s only book which improves memory instantly and removes panic and fear in Exam. and also in part two , how much pages are there ? Sir aapki is book me kitne pages bcoz me ise purchase karna chata hu but phele ye conform karna hai ki isme kite pages hai aur jitne bhi to un sabhi me only trick hi kya.....aur kitne subject isme include hai..
How many pages this book has.?? Please reply ASAP.I want to buy this book but is it very thick one or it has just this 10 pages which has been showed in the review.